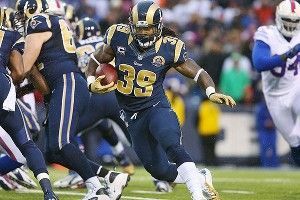 For Steven Jackson, everything about Sunday afternoon was fitting. With 1:47 left in the third quarter, and with his team trailing Minnesota 33-7, Jackson took a delayed first-down handoff and went for nine yards up the middle. With those nine, Jackson’s career total was 10,002 — a plateau reached by only 26 others. The crowd in St. Louis rose to its feet, gave a short ovation, and then watched as an incomplete pass and Jackson getting hit in the backfield made it fourth down. As Adrian Peterson’s continuing pursuit of history was cause for celebration, Jackson’s came and went without much notice. Each of Jackson’s 10,000 yards has been gained while he was a member of the St. Louis Rams, and it’s that part of it that makes his accomplishment even more impressive than it already is. There have been plenty of NFL players whose talent has been squandered on bad teams in the past decade, but Jackson deserves to be near the top of the list. In Jackson’s seven years as the Rams’ starting running back, St. Louis has tallied 23 wins, roughly 3.3 wins per season. Over the same span, the Rams have been outscored by more than 1,000 points. Since 2007, the highest finish for a St. Louis offense in total yards is 22nd. In total points, it’s 24th. For the majority of Jackson’s career, St. Louis has defined awful in the NFL, and the question as Jackson nears 30 and his career enters its twilight is just how good he might have been. Jackson’s first season as a starter was also Mike Martz’s last as St. Louis’s head coach. The Rams finished 6-10, but their struggles were mostly a result of a porous defense. A starting quarterback trio of Marc Bulger, Ryan Fitzpatrick, and Jamie Martin actually combined for more than 4,350 yards passing, and although it was no longer the Greatest Show on Turf, the Rams’ offense was more than respectable. Still, by season’s end, Martz was gone, and Dolphins offensive coordinator Scott Linehan was in. The first season under Linehan would be Jackson’s (and St. Louis’s) best in the post-Martz era. After getting only 254 carries in his first season with Martz, Jackson actually did his best Marshall Faulk following his former head coach’s departure. Jackson’s 2006 is still one of the most productive seasons in NFL history: 2,334 total yards from scrimmage, thanks in large part to 90 catches for 806 yards. In the years since, as injuries have mounted and Jackson’s elusiveness has waned, it’s become easy to forget the revelation he was during that second season. At 240 pounds, he was the biggest running back in the league while also being its best receiving one. There was no need for a change of pace because Steven Jackson was whatever pace he needed to be. The 8-8 Rams missed the playoffs, but with Bulger, Torry Holt, and the league’s newest superstar in Jackson, it seemed as though St. Louis’s offense was going to be a force moving forward. What followed are the problems that have plagued both Jackson and the Rams since. After 436 touches the season before, Jackson had his first stretch of injury issues in 2007, missing four games with a groin issue. St. Louis also saw the first of several years during which its offensive line resembled a game of musical chairs, with injuries and ineffectiveness creating a shuffling that has never really stopped. From 2007 to 2008, only Alex Barron carried over as one of St. Louis’s primary offensive linemen, and although Jason Smith is the more recent first-round bust of an offensive tackle in St. Louis, the Alex Barron era was just as much an unmitigated disaster. From 2007 to 2011, 15 different linemen started at least eight games for St. Louis in a given season. The offense plummeted following its success in 2006, from sixth in total yards to 24th. A team supposedly on the rise won just three games. It was as many as they’d win in the next two seasons combined. The team’s struggles weren’t helped by Jackson’s developing injury issues. He would miss nine starts combined in 2007 and 2008, and even when he was in the lineup, it was clear that his leg injuries were lingering. Jackson’s injury concerns are the main argument toward his culpability for the what-if status of his career, but in the end, they’re not enough to lay it at Jackson’s feet. With 91 rushing yards in his next two games combined, Jackson will make it eight straight seasons with 1,000 — a feat that, while unspectacular, is a product of consistent-enough durability. Expecting that streak to continue for two more seasons might be unreasonable, but if Jackson can add another 1,000, he’ll slide his way into the top 20, just one spot behind O.J. Simpson. It all makes for a career enviable by almost anyone — but, all things considered, it’s hard not to consider what might have been.